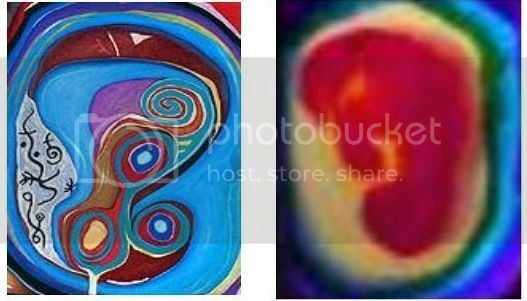 and I find the shape of the fetus looks like the part of the chamber12 painting,it is obviously not a coincidence. Is this fetus a metaphor of our humankind? Mankind in the womb of universe(first source) to be taught by wingmakers. the 1st poem of chamber12 is "wingmakers" ,"to watch the wingmakers craft my wings"
I guess chamber12 painting depicted the process of "craft wings of mankind"
Last edited by yhg342 on Sun Apr 24, 2016 10:53 am, edited 3 times in total. It's interesting about genetics for what science now is thinking they can do with it when they understand so little of the Whole of which it is but a small part and that without Spirit, or Source Intelligence, genetics means little and nothing they do with it will work successfully. Perhaps, this was also Anu's bane in wanting to create a whole race of humans without knowing how to instill souls in them.